Players include Gavin Harrison (Porcupine Tree), Tim Siefert, Andrew Small, Ron E Beck, Josh Hinden, Bill Turner, Michael Spiro, Sebastien Rosenfeldt, Rubio, and Andres Rodriguez. 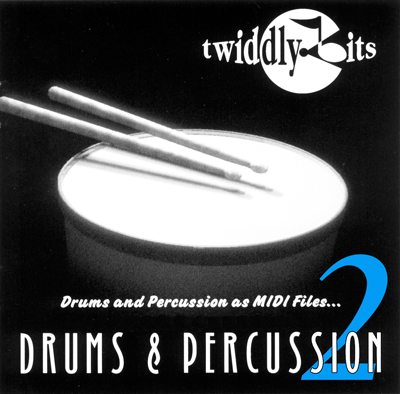 Drums & Percussion 2 is a collection of 600+ drummer-played MIDI loops, fills and motifs and follows in the footsteps of the original Drums & Percussion collection, which has been one of the most popular "Twiddly.Bits" MIDI sample libraries for more than a decade. If you are a songwriter, a producer, or you work in video and need a variety of music content 'fast' ... you play live and need a variety of realistic drum backings... this collection offers the creme de la creme of KEYFAX's MIDI drum recordings in one cost-effective collection. In the years since the original Drums & Percussion was released we have recorded countless drummers from all over the world: drummers like Ron E Beck from Tower Of Power, Tim Siefert from The Yardies; American drummers, English drummers, African and Latin American drummers, none of whom contributed to the original Drums & Percussion library and all of whom have helped create masterful drum loops and fills for subsequent style-based collections that looked at Reggae, Salsa, Hip Hop, electronic dance music, and more. This collection features a dozen 'Rock' Patterns spanning classic rock loops and fills to blues shuffles, rock ballads, funk and 3/4 time feels. In the hip hop and R&B categories you'll find everything from breakbeats to 808 loops, classic West Coast feels to high energy jungle with both loops and fills on offer. There are more than 40 individual and cutting edge electronic/dance loops and fills - enough to inspire months of electronic wizardry. Sometimes you find yourself working in genres beyond your comfort zone and there's nothing worse than 'fake' jazz or Latin drumming. The collection features some peerless Latin and jazz loops recorded by top players in their fields. Same goes for the beautiful reggae loops and fills, and also the traditional country patterns. The percussion loops are based on individual instruments - congas, bongos, shakers, bells and blocks, tambourines etc. These can easily be combined with the full kit loops in the collection, or simply added to pre-existing drum tracks to add spice and life. SMF Type 1 file format. Guaranteed to work with all DAWs and hardware sequencers that can load/import .MIDs: Cubase (all versions, including LE and Sequel), GarageBand, Pro Tools, Logic, Acid, Reason, Ableton Live, FL Studio, Live, and Cakewalk (all versions), and with all VSTs or synth sound sources. Automatically included in the download are versions of this product saved in 'Pattern' format for Motif ES, XS, and XF. When you load the library into a Motif you will get a series of Patterns named according to type (Tambourines, Congas, 44 Rock etc). With up to 16 loops in each Pattern you can just load, solo a track and hit Play. The voicing will be appropriate and looping automatic. You can re-voice them, play them at any tempo, cut and caste them into existing Songs or Patterns, or just be inspired and just jam along... with these incredible - and real - players. Most of the demos are simply one or two loops from the named Pattern, taken direct out of a Motif. Demo Pattern is one of the R&B loops. Demo Song uses the same loop as the basis for a song. The original R&B loop was first copied into an empty Pattern and then the individual drums were placed on individual tracks using the Job > Divide Drum Track macro. The beauty of doing this is that now you can choose a separate kit for each individual instrument. For this song we selected a thinner sounding hi hat and, by copying the snare part onto two separate tracks, selected two separate sounds, alternating them on beats 2 and 4. This, initially 4-bar loop, was then set to 32 bars for an improvised electric piano part, which was executed in one take. A synth bass part (also Take 1!) was added. A conga and then a bongo loop from Drums & Percussion 2 was set to come in mid way through the song along with a little lead synth refrain. Finally, a loop from the Colombian beats Pattern comes in on the outro. The entire demo took less than an hour to select, compose, deconstruct and record and is based upon just one of Drums & Percussion 2’s more than 600 individual loops.